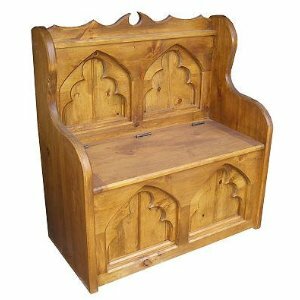 A lovely Gothic design, and practical too with storage under the seat. Perfect for a dining room, kitchen or hallway, where you want to introduce some serious style. 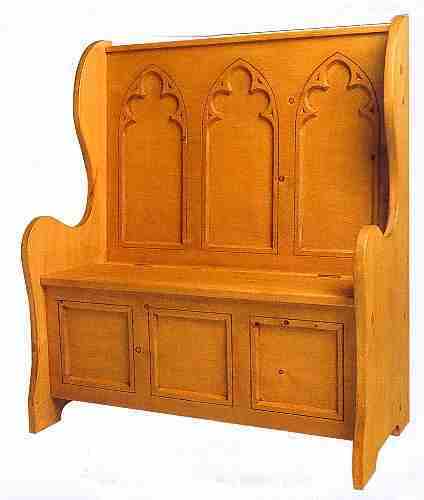 Finished in Golden pine ( although we could further decorate this for you with rich painted Gothic designs. We have also shown a version that was stained and lacquered to simulate dark Oak furniture. Ref. GS. 2 seater; size W 38" x ht 44.5" x D 18.5" / W96 x H113 x D47cm. 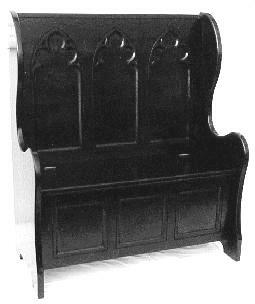 A lovely Gothic design, and practical too with storage under the seat. Perfect for a dining room, kitchen or hallway, where you want to introduce some serious style. 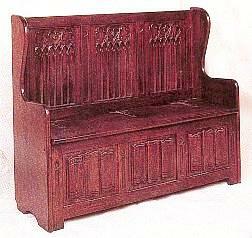 Finished in Golden pine, although we could further decorate this for you with rich Gothic designs. Standard size; ht 1M x wth 1070 x D470mm. These can be made to special sizes if required, at small extra cost. L122 x D60cm. Ref 01/115. 152.5 x 60cm. Ref 01/116. 183 x 60cm. Ref 01/117. 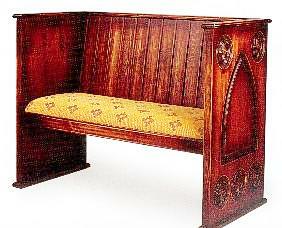 Although a very similar sized bench to those above there is a great deal more work has gone into it with all the carved Gothic detailing, from traceried back panels to linen-fold base panels. The seat lid is hinged to give plenty of storage inside. Ref C137. Expensive -Made to order.